8/31-9/25: “Umezawa Fumio Special Performance” Wasamin has been cast in this special play/song/dance performance at the famous Meiji-za Theater in Tokyo, starring along with Umezawa Tomio and Ken Naoko. (Just Announced!) 9/29-9/30: Wasamin Special Performance on Sado Island! It has finally been scheduled. 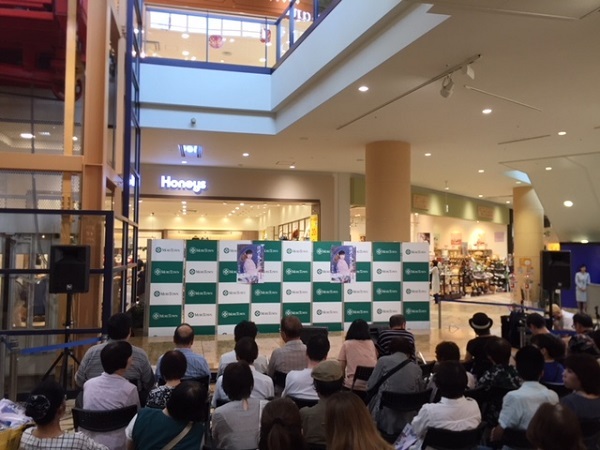 Misaki-chan will perform in Niigata on Saturday, then sail over to Sado Island for a performance there on Sunday Afternoon. This was just announced, so the details are still coming, but from the looks of it there will also be an fan club event on the ferry over. 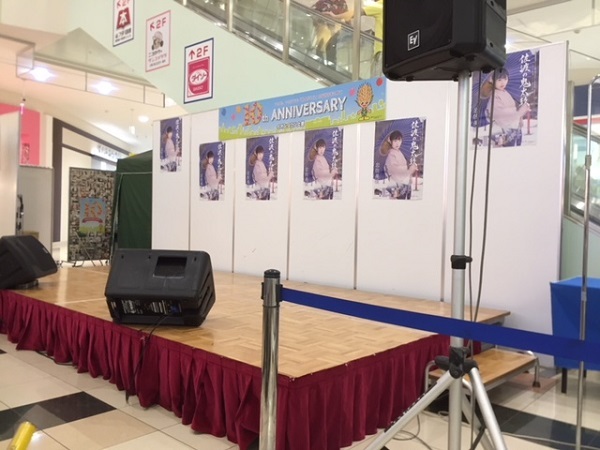 10/8: Concert at Minoh Spa Onsen, Osaka We are still waiting for details on this one as well, but it is a concert at an Onsen, something Wasamin did once before early in her solo career. 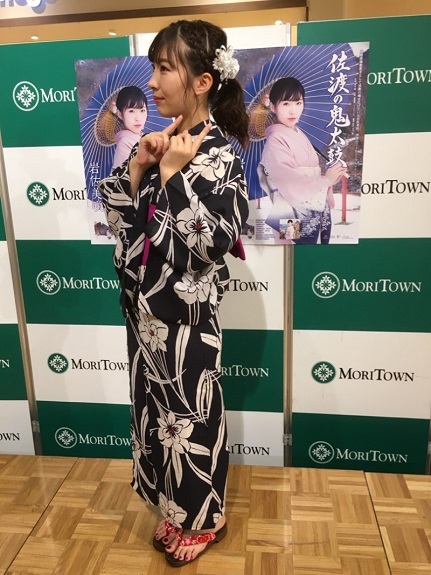 11/7: Yamano Music Autumn Enka Festival, Ginza What has become a tradition, Wasamin is a regular invitee to Yamano Music’s Enka Exhibitions. 11/17: Iwasa Misaki 7th Single Special Cheki Event at Nippon Crown I originally didn’t apply for this the first time around, so I am praying they will have “on the day” tickets. They probably will, so I’m not too worried. (New!) 11/24: Iwasa Misaki Winter ‘Love Live’ Vol. 2 Wasamin acoustic concert, Yatta! At this point I have a ticket to the play, an application in for the Yamano Music Enka Festival, and I will definitely go to ‘Love Live’ I am definitely interested in the Sado Island and Minoh Spa events, I’m just waiting on the details. But it is going to be an exciting Fall for Wasa-fans! I originally considered skipping this event, since I planned on going to all of the other events she had scheduled in the Kanto Region this week. 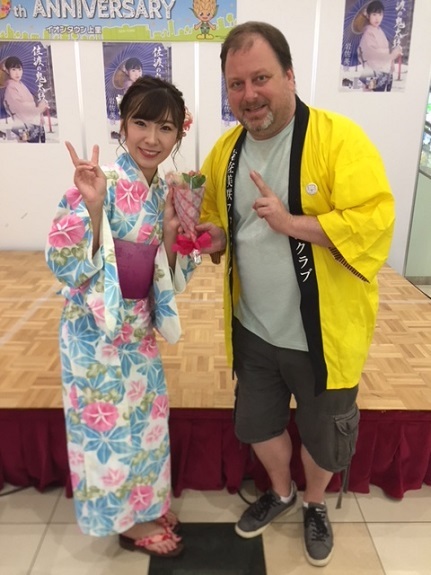 But after thinking about it, I didn’t have anything else to do on Friday, I didn’t want Wasamin thinking I had skipped her live to attend AKB48’s Handshake Event, and despite the event being in Western Tokyo, it really wasn’t that far. That settled it, I was off to Akishima. I arrived around 45 minutes before the first performance. Most of the seats were taken by the locals, and a few early-bird Wasa-fans. Instead of staking out a spot, I went to have coffee at the nearby Excelsior Caffe, returning just before showtime. I am always hard pressed to come up with poses. 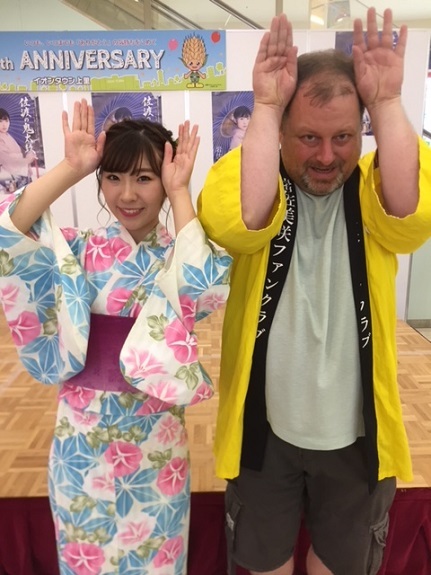 When I decided on this pose, Wasamin was like “What the heck is this?” I called it the “Baka” pose. She was like “Why is it a “Baka Pose?” I don’t know, Misaki-chan, it just is! In any case, I wanted to talk to her about the books I was reading. As part of a class next semester, I need to read a bunch of novels by Japanese authors. I was telling her which authors I was reading, and she lit up when I mentioned Kanae Minato. She was like “Which book?? ?” The problem was that I couldn’t remember the Japanese name, only the English title. Naturally, Wasamin wasn’t familiar with the English title. As I was walking away I thought I remembered the title, so I told Ichikawa-san. However, when I sat back down I realized that it although Kanae Minato did write a book with the title I mentioned, it was not the one I read. I would need to rectify this issue with my next ticket! During the break I looked up the Japanese titles of some of the books I have been reading. Apparently Ichikawa-san told Wasamin the title I originally said, but I corrected her and told her I had read Koukuhaku. Wasamin absolutely lit up. “I read that, I love that book! Did you like it? Wasn’t it scary?” I was so excited to be sharing this with her. Earlier I had mentioned another author Wasamin didn’t initially seem familiar with, but I knew it was a famous manga, so when I told her the title of that one, she again was like “Oh yeah, I know that manga!” She started giggling, and mentioned to Ichikawa-san that I was reading Otouto no Otto. I think she found it funny that I was reading it because it’s a gay-themed manga. She asked if I liked it, but I actually haven’t started it yet. It is next on my list. 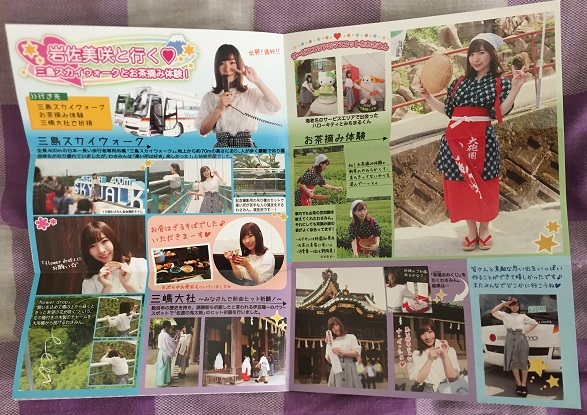 But I think I will mention more of the titles I am reading since most Japanese people I have mentioned them to seem to know them, and Wasamin does enjoy reading, so there is a good possibility she will be familiar with those too. When I got to Saitama it was pouring. Plus, there were lightning bolts shooting down from all directions. In fact, one of them looked like it hit about a block to my right. It was quite scary. I didn’t know whether to take cover, or to just run for it. Eventually I safely made it to the mall, and dried off a bit before heading to Yamano Music to get the CDs. After that I camped out in Choco-Cro drinking an iced coffee while waiting for the storm to blow over. 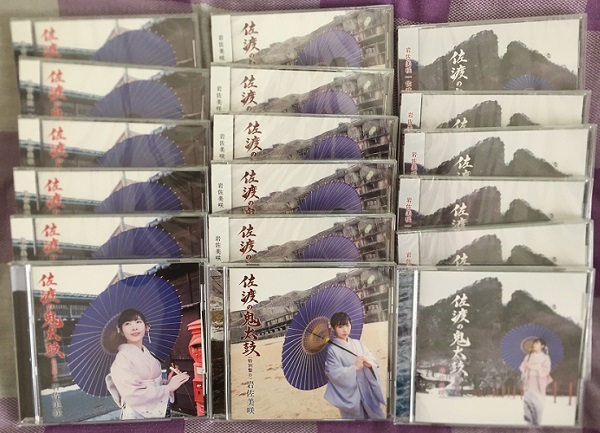 Meanwhile, here are the setlists from Wasamin’s performances in Fukuoka and Hiroshima. Amazingly, Wild-san, who is from Shiga Prefecture (near Osaka) drove to Tokyo this past week, then drove to Fukuoka and Hiroshima, before coming back for the final event at Kamisato. Talk about commitment!!! This time I decided to show off the oshi-towel I received as a gift. Wasamin giggled with embarrassment, “Natsukashii!” I know, it IS natsukashii, but it’s a cool gift, right? I pointed out Tanaka-san, who was watching from the back. I then added that I have a lot of Wasa-souvenirs, but I did not have that oshi-towel, so I was very happy to receive it. I saved the other four tickets for the second performance. In the meantime I decided to do a little window shopping. 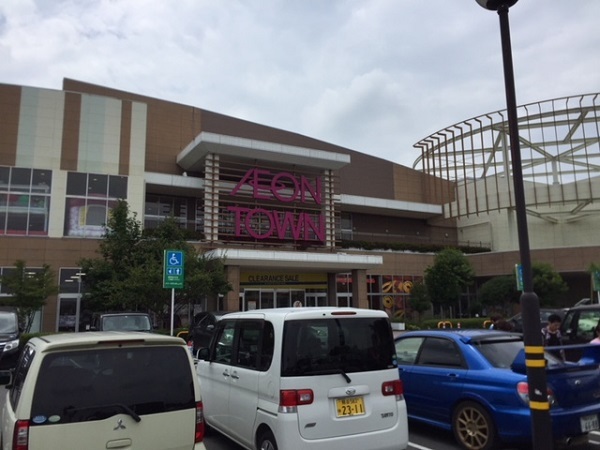 This particular Aeontown is quite small. It doesn’t really have any big brand-name stores. Even the CD shop seemed to be an indie. I was looking for a specific English-translated book, but their book shop, as big as it was, didn’t have an English section. Finally the late performance rolled around, after which I lined up for my first shamekai. 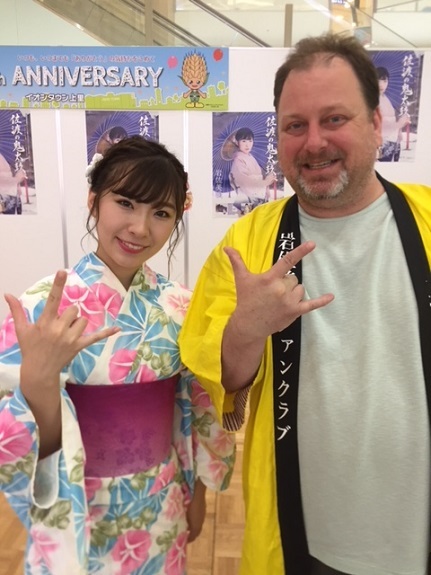 “Hang Loose Dude” I explained to Wasamin that this is a “Hawaii Pose” What I had failed to mention was despite pre-ordering a ticket for Wasamin’s play, I have forgotten which date I applied for. I am waiting for the ticket to arrive to know which show I am going to see, LOL. 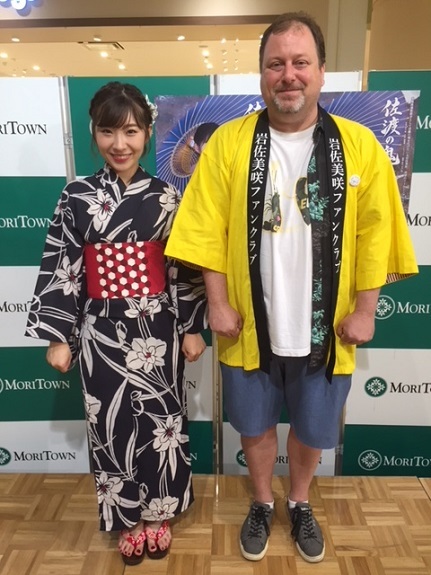 However, I told her I was very excited about the upcoming Sado Island Performance. I told her I would do my best to go since I’m sure it will be a lot of fun. And Wasamin confirmed, there WILL be a Fan Club event on the boat. The only question now is how expensive will this event be? The boat tickets are around 2500-3000 yen each way, and hotels range in price. Of course you have to tack on the Shinkansen ride to Niigata as well. 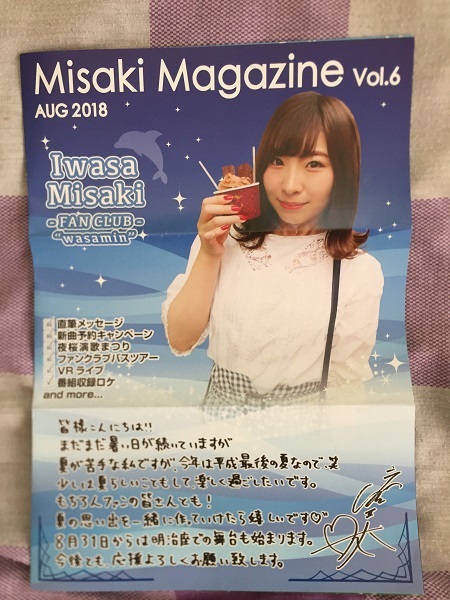 Not only did I get a copy for Misaki-Magazine #6, but I also got the pre-order form for the Winter Love Live Concert. So I will head over to the Post Office later today and put in my order for that ticket. 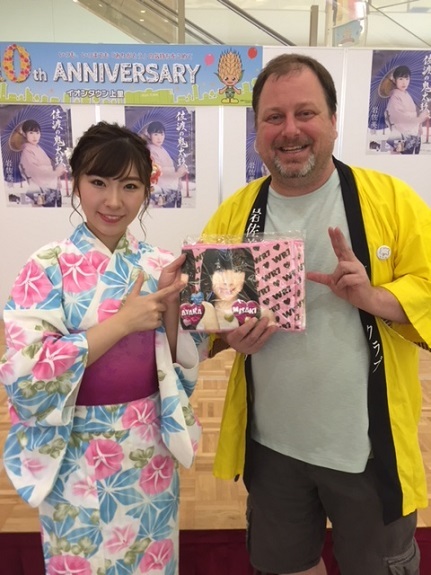 And with that, another super-fun Wasamin CD promotional week in the books!